Humans need to learn to co-exist with wildfires. Here’s how we can do it. As housing developments creep into wild and natural areas, proactive planning can reduce the risk of harm in the face of fire. January 30, 2018 — In 1992, the city of Wenatchee, Washington, experienced a devastating wildfire that roared through a neighborhood, destroying more than 30 homes and burning over 3,000 acres (121 hectares) in a matter of days. It left the community shaken. “It’s a terrible thing for the community to go through,” said Wenatchee economic development director Steven King. The wildfires began in the shrub steppe and grasslands that surround the city. Recent development had pushed new housing into undeveloped areas, creating what ecologists refer to as a wildland-urban interface (WUI). WUI landscapes are common in the western half of the United States, but exist throughout the North and Southeast, too. Homes and other buildings constructed along such interfaces are becoming increasingly prone to fire disaster, thanks to a perfect storm of conditions: a warming climate that produces more fuel for wildfire combined with short-sighted development that ignores the risk inherent in wildfire-prone ecosystems. A growing body of wildfire experts and policy-makers now agree the vulnerability to disaster for these communities is ultimately a development planning issue — not a wildfire prevention issue. Former U.S. Forest Service research scientist Jack Cohen, who spent his career studying wildland fire and helped develop the U.S. National Fire Danger Rating system, is quick to point out that wildfires in WUI zones are not only completely natural, they’re also unavoidable. “They have been an ecological factor for almost all of the ecosystems in North America in their development since the last ice age,” he says. How can we better live with the reality of wildfires? Cohen recommends that preparedness policies expand beyond firefighting and vegetation burning in public lands toward measures that help ensure that homes located in WUI areas can actually survive a fire. Fire-adapted development requires a fundamental shift in perspective about wildfires and the threat they pose to residents in WUI areas. Preventive strategies include improved urban planning and land management; collaboration among federal, state and local agencies; and campaigns aimed at educating the public about wildfire preparedness. Cohen is an early pioneer in efforts to minimize fire damage to homes. In 2001 he devised an assessment concept called the home ignition zone (HIZ) that helps homeowners determine how vulnerable their home is to wildfire by looking at factors such as building materials, vegetation and debris within a 200-foot (60-meter) area immediately surrounding the house. Urban planning for WUI areas now centers on creating and maintaining development and building codes that incorporate the HIZ principles. These codes promote practices such as using fire-resistant building materials for siding and rooftops; maintaining “defensible space” by clearing dead leaves from rooftops, gutters and decks; trimming trees and removing vegetation that can fuel fires during the dry season; and governing subdivision design to include multiple routes by which residents can flee and fire-fighting equipment can enter. Collectively, these types of policies are loosely referred to as WUI codes. The city of Wenatchee adopted a set of WUI codes in 2011 based on guidelines developed by the International Code Council. “We were pretty well ahead of our time for this part of Washington for doing that,” King says. But implementing new codes takes years. In 2015, the city suffered its worst wildfire season to date and lost more than 30 homes. “Unfortunately, those WUI codes didn’t exist when those homes were developed. As a result, that disaster was worse than it could have been if those homes had been built today,” King says. WUI regions can be checkerboards of U.S. Forest Service, Bureau of Land Management (BLM) and private lands. The big challenge is getting land use management agencies, fire departments and private landowners to work together to develop and maintain strategies for preventing wildfire damage. Collaboration across all levels of government is a critical piece of wildfire preparedness.Alison Green, program director of Project Wildfire in Deschutes County, Oregon, says collaboration across all levels of government is a critical piece of wildfire preparedness. 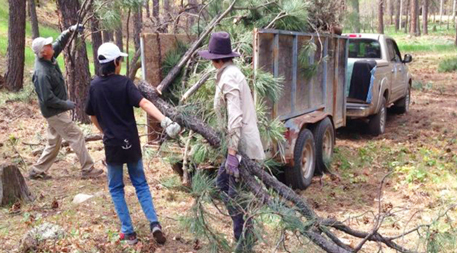 Begun in the 1990s, Project Wildfire is a community-led effort that functions as the county’s official wildfire mitigation body. It’s governed by a 27-person steering committee whose members include elected officials, residents, and representatives of the BLM, U.S. Forest Service, Oregon Department of Forestry, local fire districts, insurance companies and homeowners’ associations. By bringing everyone to the same table, Project Wildfire is able to coordinate efforts such as public education campaigns, prescribed burns, community-wide debris cleanups and home risk assessment events. Another important piece of the wildfire adaption puzzle is getting residents on board with strategies to reduce the threat to their homes. 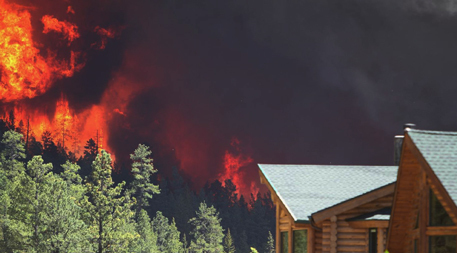 Ultimately, this requires convincing homeowners to take personal responsibility for wildfire preparedness. 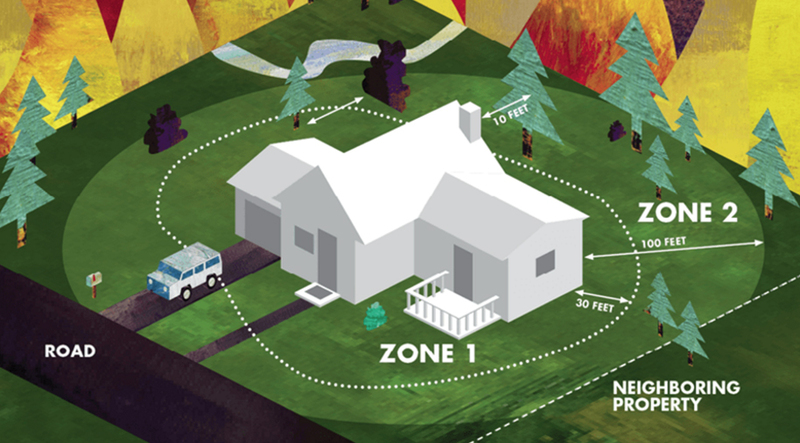 Homeowners in WUI zones have much more power over their home’s ability to survive wildfire than previously thought. They can dramatically reduce risk of their house catching fire by doing things like creating and maintaining defensible space and keeping HIZ areas clear of debris. 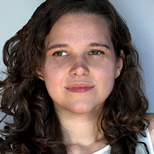 Communities across the U.S. have taken different approaches to public outreach and WUI code enforcement, says Kimiko Barrett, policy analyst at Headwaters Economics, which co-manages Community Planning Assistance for Wildfire (CPAW) in partnership with the community wildfire planning organization Wildfire Planning International. San Diego, California, for example, is notorious for its code enforcement: The fire department inspects homes located in high-risk areas and fines homeowners not in compliance. “They take a very aggressive approach to structure development and building code standards for high risk areas,” Barrett says. But enforcement requires resources, so many communities rely instead on education. Initiatives include holding workshops on how to prepare for wildfire season, appointing wildfire ambassadors in at-risk neighborhoods and offering free debris pick-up events. Even without enforcement, there’s proof that such preventive wildfire adaption approaches are worth the effort. Thanks to remarkable efforts undertaken by elected officials, agency representatives and engaged residents — and all coordinated through Project Wildfire — Deschutes County hasn’t lost a single house to wildfire since 2003. That’s exactly the type of result WUI communities like Wenatchee are working to achieve today.